Hardcover, 228 pages, over 200 color photographs, 12 x 12 inches. Lake Superior defies simple description, and one or a few summer visits to the lake provide only a faint acquaintance. The lake's greatness is outlined in its physical qualities. It is the world's largest freshwater lake by surface area, at 31,700 square miles (82,170 square kilometers), and contains more water than all the other Great Lakes combined. In fact, it contains 10% of earth's fresh surface water. More than 300 streams and rivers empty into Lake Superior. The deepest point in Lake Superior is 1,300 feet (400 meters) below the surface. These are impressive facts, but they fall short of supplying comprehension. Years of exploring the lake and its surroundings may be required to begin to get a sense of this geographic feature--and that is just what Jeff Richter has devoted to the task. Richter's new book, Pure Superior, is a landmark photographic exploration of the greatest of the Great Lakes. The photographer has invested countless hours of effort over the last decade, capturing memorable moments on film across the entirety of Lake Superior and its watershed. This collection of images is the culmination of that effort. "I find few things in life as rewarding as recording the lake in its ever-changing moods. It really is a spiritual balm for me," says the photographer. From serene, clear-blue summer days to -30 degree winter days under angry gray skies, Jeff has created a catalog of those moods, in scenes from Isle Royale National Park to Wisconsin's shores and the Apostle Islands, to Minnesota's North Shore, along Canada's wild shores and parks, and across the spectacular Upper Peninsula of Michigan. There are many well-loved and popular places here, along with others that are hard to reach and rarely visited. 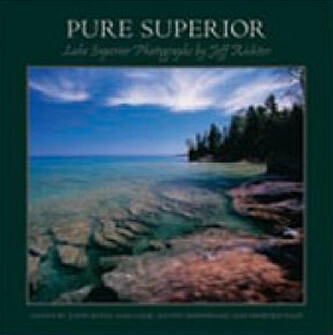 Pure Superior contains over 200 photographs that include not only sweeping vistas of the lake, but also close-ups of the natural artwork wrought by wind and waves, and glimpses of the wild creatures who inhabit the landscapes surrounding Superior. The richness and diversity of the entire watershed is told through the lens of Jeff's camera. From seldom-seen lynx, wolves and moose to the common raven, Jeff's explorations have yielded many superb wildlife shots, and he shares some of his favorites with us in this volume. Four well-known writers have also contributed their perspectives on Superior. Sam Cook of Duluth, Minnesota; John Bates of Manitowish, Wisconsin; Justin Isherwood, Plover; and Howard Paap of Bayfield, Wisconsin; all lend their wit, wisdom and passion for this unique, incredible natural resource. Their perspectives are given in amusing stories; bits of history, literature and natural history; facts about the lake; and personal experiences. "Despite the growing trend in digital photography, Jeff's purist approach of using raw color and light, and uncanny ability to capture on film profound beauty in that 'precise wild moment,' are testament to his dedication to preserving all that is natural." "There is a wave-worn stretch of rock on Superior's shoreline that is fixed in my psyche as a source of solace and hope. I often visualize that rock . . . on a calm summer evening, caressed by clear cool water; or drenched by storm surf. Sometimes I think of it cold and still, enshrined by a necklace of pack ice. It is beautiful, perennial, yet endlessly changing. Jeff Richter's photographs capture that same sense of Superior; austere and remote, but with a beauty that tells us 'all will be well in the world.'"